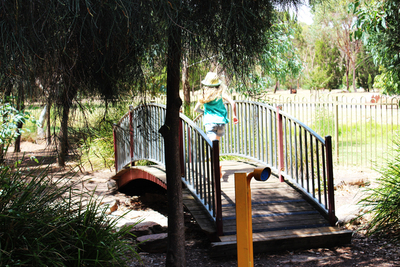 Tucked away in the Southern Parklands, Marshmallow Playground is almost as magical as it's name suggests. 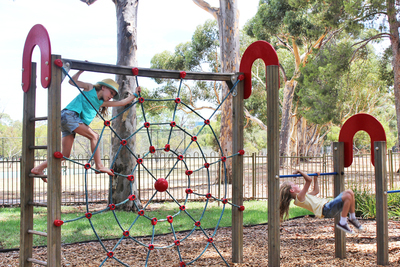 It's a playground that feeds young imaginations, offering a safe and fun place to play in the CBD. It's impossible to miss the huge tree that sits in the centre of the park. 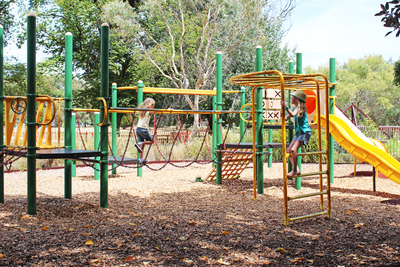 It's large shady boughs mean that Marshmallow Playground is one of the most sun-safe playgrounds around, most of the play equipment falls under its shade and parents can also enjoy the shade while kids play. Of course the tree has other purposes too, it's a great climbing tree as long as there is someone around to give kids a boost. The thick branches are perfect to explore. The main play equipment is pretty standard. There are swings, a slide, a bridge, and some monkey bars. It's a fairly classic style, but it's still quite large. 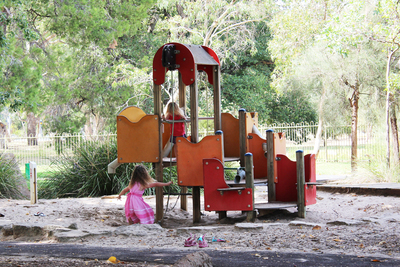 Younger kids will love the smaller cubby house style equipment that's even surrounded by a sandpit. 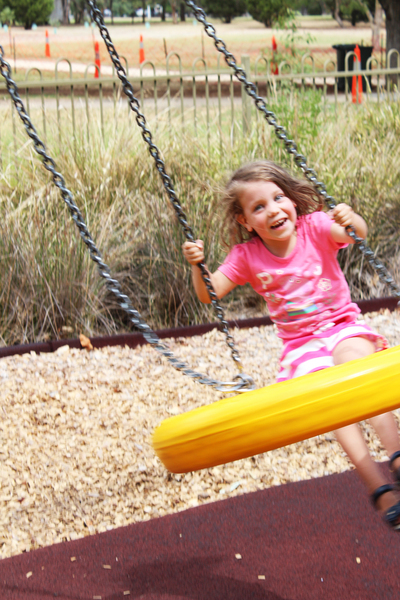 There are pulleys and shoots to integrate sand into the play, as long as no one starts throwing sand it's great for kids who aren't quite up to the full-size playground. In another corner there's a small spider's web climbing frame, and poles perfect for practicing backflips. There isn't an oval inside the fenced playground area, but the playground is part of the Pityarrilla (Park19) area, which has a huge amount of space for kids to run around or kick a footy. Of course inside the playground there is still plenty of room for fun and games. There's a little bridge, and tunnels to climb through, each helping foster imaginative and creative play. Just outside of the playground fence you'll find a barbeque and picnic table set up, and outside by Glen Osmond Road there is a public toilet. Unfortunately the automated public toilet can be a little bit confusing for younger kids who might not understand the buttons for opening and locking the door. As soon as we arrived at the park the 4-year-old rushed off, then I head a cry of "this is the best park ever!" There was a general consensus that everyone was pretty impressed. Not wanting to insult a single piece of equipment the 4-year-old's favourite thing was "everything". 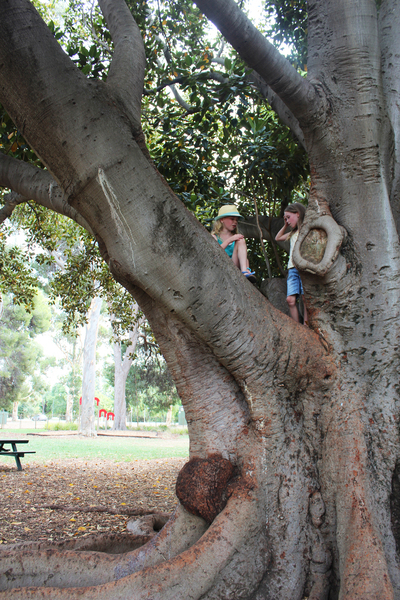 The 11-year-old thought the climbing tree was the best, while the 8-year-old loved the monkey bars, the 13-year-old was just glad there was shade. 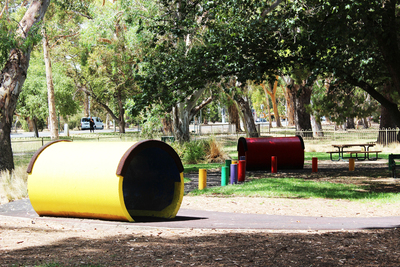 Where is Adelaide's Best Playground?